Nutella is a spread flavored with hazelnut and cocoa. First introduced in Italy in 1964, the product is popular throughout the world. World Nutella Day, first held in 2007, was the brainchild of Nutella enthusiast and blogger Sara Rosso. Fans love it. Each year Nutella maker Ferrero selects one Nutella lover to lead the celebration. 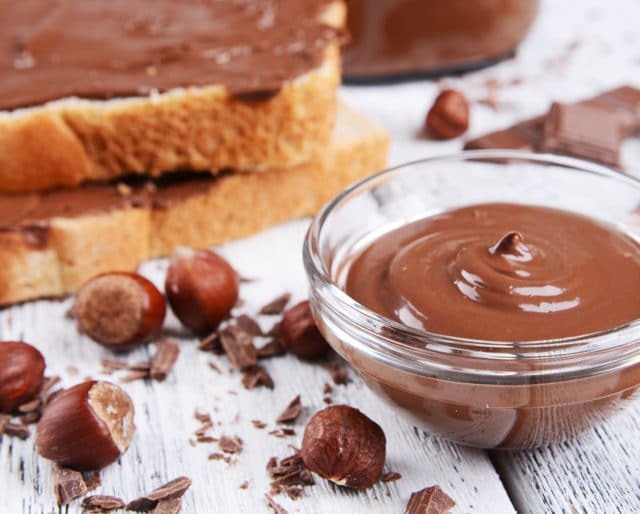 On February 5, Nutella fans post pictures, recipes, and messages declaring their love and loyalty to the popular spread. The first Nutella Cafe opened on Chicago's Magnificent Mile. Nutella marked its 50th anniversary by holding celebrations in 10 countries throughout the world. Nearly 28,000 Nutella enthusiasts gathered in Gelsenkirchen, Germany, to participate in the world's largest continental breakfast. Australia discovered Nutella. "Aus-tella," anyone? Nutella launched in Australia and opened its first plant outside Europe — in Sydney. The son of of the company's founder created the first-ever jar of a new hazelnut cream. He soon named the new delight Nutella. If you've never tried Nutella, you can find it at almost any grocery store. Pick up a tub of the creamy mixture. Putting it down is the hard part. There are lots of recipes online for baking with Nutella, but that doesn't mean you can't come up with your own. The company encourages fans to explore new ideas for baking with Nutella, and to spread the word when they come up with something delectable. World Nutella Day offers a host of opportunities for Nutella fanatics to get involved. You can host a Nutella party, write a Nutella poem or song, or create some Nutella art. You can also share photos and recipes on social media using the hashtag #WorldNutellaDay. Find two slices of bread. Spread a thick layer of Nutella on one. Slap the other on top. And there you have it! Nutella makes a perfect topping for ice cream, especially after being heated up. Nutella goes well on a bagel or as stuffing in a crepe. Rather than using a regular creme or custard filling for your donuts, try Nutella. Just rip the top of that tub of Nutella and have at it with a spoon. It's the perfect combination of cocoa and hazelnut! People of all ages — kids, teens, and adults — go nuts for it. Chefs throughout the world can only wish they had come up with the combination that has put smiles on so many faces. The beauty of Nutella is that you can put it on almost anything. Kids eat Nutella sandwiches. You can make Nutella ice cream. You can bake Nutella cakes and brownies. Ferrero, its parent company, practically begs you to find a dessert in which Nutella won't work. There was a shortage of cocoa in the Piedmont region of Italy back in the 1800s. To stretch the supply, chocolate was mixed with ground hazelnuts, and the kids went crazy for it. When the cocoa supply returned, the kids refused to switch back. Nutella became the creamy version of the mixture, which was initially produced in blocks.